Since the release of Arthur Ransome’s Swallows and Amazons in 1930’s, each and sundry, kids and elderly, all have been equally captivated by this tale of companionship and adventure. And this enchanting story has recently been adapted into a movie reviving the nostalgic memories of the blithe, heroic exploits of youth. The narrative by Arthur Ransome was so picturesque that we can literally envisage the beautiful places. These vivid places and environment that he described in the book were not imaginary, but they depicted the real backdrops and vistas of beautiful Lake district. He weaved the story of the heroic adventures magnificently in the locales of Windermere & Coniston Water. 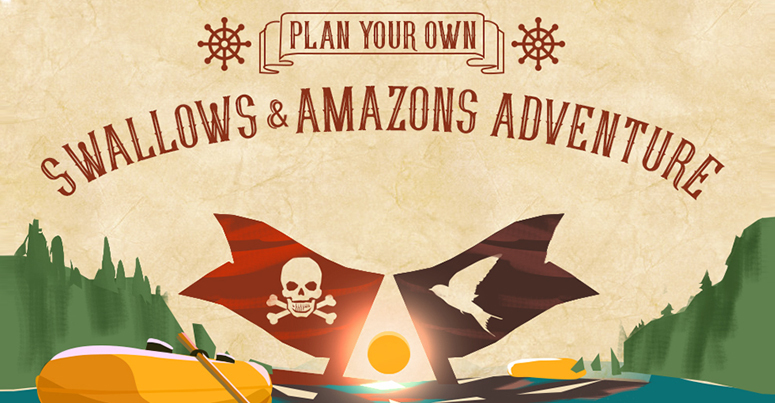 The good part is we can recreate our Own Swallows & Amazons Adventure journey and follow the footsteps of our favourite protagonists enjoying the different activities like sailing, treasure hunting etc. This infographic gives you a peek into Windermere Lake District to help you plan your sojourn, animating the adventurous trip, soaking in the beauty of lakes while riding on houseboats, picnicking around Keswick’s ambiences, peeking into historic Ransome’s writing desk and also kayaking, face painting and sailing.